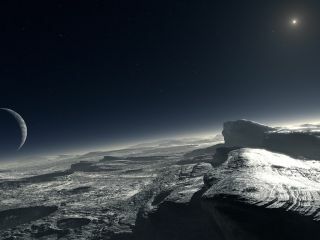 Artist's concept of the surface of Pluto. Faraway Pluto is difficult to study from Earth, so the dwarf planet has remained largely mysterious to scientists and laypeople alike since its discovery in 1930. But Pluto is about to get its first close-up. On July 14, NASA's New Horizons spacecraft will zoom just 7,800 miles (12,500 kilometers) from the dwarf planet, capturing supersharp images of its frigid surface. Myth 1: Pluto was named for the Disney character. A close look at the chronology dashes this myth. The famous Disney dog debuted in 1930, but he was initially named Rover; a cartoon featuring "Pluto the Pup" didn't air until 1931, a year after the celestial object was discovered and named. Myth 2: Pluto is tiny. Myth 3: It's dark there all the time. Pluto orbits more than 3 billion miles (4.8 billion km) from the sun on average, so many people imagine that it's pitch-dark on the dwarf planet's surface 24 hours a day. But that's not the case, said New Horizons principal investigator Alan Stern, of the Southwest Research Institute in Boulder, Colorado. Myth 4: Pluto was once a moon of Neptune. This is an old theory that became popular shortly after Pluto's discovery. It was disproven in 1965, when researchers found an orbital resonance — a gravitational sweet spot in which the orbits of two bodies are related by a ratio of two whole numbers — between Pluto and Neptune. This resonance prevents the two objects from ever closely approaching each other, Stern said. Myth 5: Pluto is an ice world. Pluto's surface is covered by a number of ices, including frozen nitrogen and frozen methane. But the density of Pluto as a whole is twice that of water ice, showing that the dwarf planet's mass is made up of about two-thirds rock and just one-third ice. Therefore, it's more accurate to say that Pluto is a rocky body with an icy shell. Myth 6: Pluto is airless. Researchers discovered in the 1980s that Pluto has an atmosphere, which is composed mainly of nitrogen, just like Earth's atmosphere. But Pluto's air, which also contains carbon monoxide and methane, is much thinner than Earth's, and it extends significantly farther out into space. For example, Earth's atmosphere reaches 370 miles (600 km) or so beyond the planet's surface — about 10 percent of Earth's radius. By contrast, the outer limit of Pluto's wispy, variable atmosphere lies about seven Pluto radii from the dwarf planet's surface. The volume of Pluto's atmosphere is thus more than 350 times that of the dwarf planet itself, according to New Horizons co-investigator Michael Summers. Myth 7: Pluto's orbit is one of a kind. Pluto's orbit is quite elliptical, taking the dwarf planet as close as 2.75 billion miles (4.43 billion km) to the sun, and as far away as 4.5 billion miles (7.31 billion km) from our star. The dwarf planet's orbit is also inclined by 17 degrees relative to the ecliptic, the plane of Earth's path around the sun. Pluto's orbital parameters are thus quite different from those of the eight "official" planets (a group that included Pluto until 2006, when the International Astronomical Union demoted the object to "dwarf planet" status), which tend to lie roughly in the same plane and move around the sun in more or less circular paths. But some other Kuiper Belt denizens, such as the dwarf planets Eris and Haumea, have even more elliptical or inclined orbits, as do a number of alien planets.